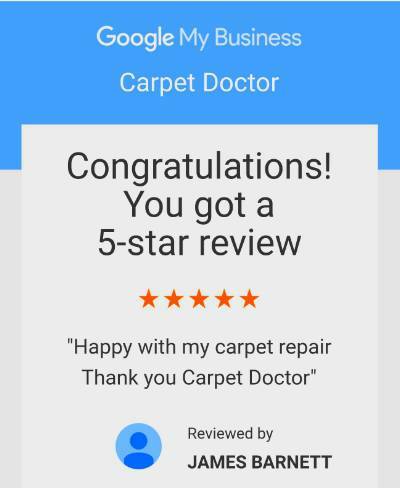 Another satisfied customer searching for carpet repair Birmingham, finding Roy at Carpet Doctor. With a wealth of knowledge and experience, Carpet Doctor provide professional carpet repairs in Birmingham city centre and surrounding areas. It`s what we do best. Carpet Doctor specialise in repairing burn damaged carpets, re-stretching, re-tufting, and re-adaption carpet repairs in Birmingham. A variety of carpets new and old can be repaired to an invisible standard by the carpet repair Birmingham specialists at Carpet Doctor. For a cost effective professional carpet repair in Birmingham, Tamworth and the surrounding area, then Carpet Doctor is the only real solution for you. Midlands based company Carpet Doctor promises to deliver miraculous results with their unique carpet repair service. Carpet Doctor has the certified ability to repair almost any carpet almost anywhere to suit every budget. From Iron burnt imprints to the most common cause of carpet damage caused by pets, this companys brilliance is no illusion. A family run business established in 1997, dedicated to saving the lives of carpets using professional tools for expert carpet repairs in domestic and commercial properties around Birmingham, Tamworth, Coventry and across the UK. Offering a friendly and personal service, Carpet Doctor strive to please on every level when providing specialist carpet repairs in Birmingham. Below is a recent Testimonial for a carpet repair in Birmingham city centre. Steven Adams. Upper Marshall St, The Mailbox, Birmingham B1.